The Mills Design wallycento Tango was first to finish the 2018 edition of the Rolex Giraglia, leading home her sister wallycentos Galateia and Magic Carpet. This result gave her victory in the combined inshore and offshore parts of the Rolex Giraglia event, starting with inshore racing in St. Tropez, and finishing with the historic offshore race to Genoa. The Tango team led by Marc Pajot are rapidly coming to terms with the new and highly sophisticated 100 footer, having bested their more experienced wallycento rivals in both of the Wally events so far in the 2018 calendar. 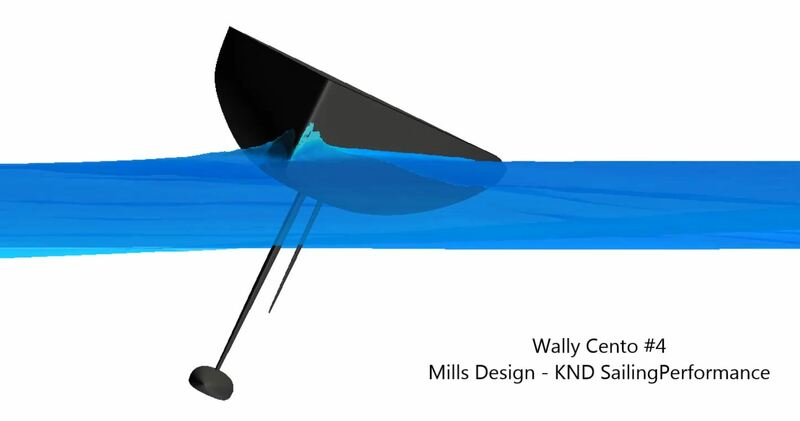 An extensive R&D program was undertaken for WallyCento#4 with our R&D Partners KND/Sailing Performance, including hull and appendage CFD studies in both panel code overseen by partner Roland Kleiter, and RANS headed by Dimitri Nicolopoulos which included appended modelling in waves. These programs build on their experience developing the 2014 Maxi72 World Champion Alegre, foiling IMOCA 60’s, and the Volvo 65 VPP. A key component of the process is targeting the design to a carefully defined weather and course model reflecting Wally Class events in the Mediterranean, using a decade of historic weather data both from logged event data and data recorded by weather services adjacent to sailing venues. The final hull shape exhibits a combination of low drag in lighter conditions and increased stability in more wind that makes her more versatile than previous generations. The single rudder chosen reflects this optimisation to the condition set which includes a mix of windward/leeward as well as coastal courses.